Procession will visit 7 cities in week-long journey from Florida to Washington, D.C.
A 3,200-kilometer rally dedicated to the 70th anniversary of the allied victory in WWII and the 70th anniversary of the meeting of Soviet and American troops on the River Elbe is to be held on April 18-24 in the United States. As the Russian-American Community Center in Florida told a correspondent from the TASS news agency on April 8, the purpose of the rally, which will make its way from Florida to Washington, “is to widely publicize the historical role of the USSR in the victory over Nazi Germany in World War II." The rally will start on April 18 from Liberty Square in Naples, Florida. 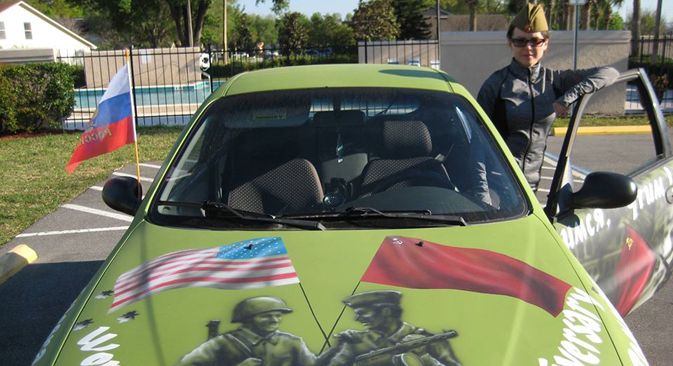 The crews of five cars in the rally include activists from Russian-American organizations in Florida and WWII veteran Alex Farfel, who became a son of the 133rd Tank Regiment at the age of just 10. According to the organizers, the cars will be decorated with festive symbols. The convoy will move along the route Naples – Miami – Orlando – St. Petersburg – Tallahassee – Atlanta – Washington. Seven thousand St. George ribbons [symbols of Russian military valor] will be distributed in the seven cities along the route. In the U.S. capital the participants of the rally will take part in a wreath laying ceremony on April 24 at the Arlington National Cemetery at the “Spirit of the Elbe” memorial plaque. Olga Zatsepina, president of the Russo-American heritage organization Naslediye, told the TASS correspondent that the rally is expected to be joined by representatives of the State of Texas on April 20, and by representatives from Washington and New York on April 24.